OroCRM supports out of the box integration with Magento. The integration enables loading data from and to a Magento-based eCommerce store (“Magento store”) and processing it in the OroCRM. This article describes how to define and edit the integration and synchronization settings. While Magento integration capabilities are pre-implemented, OroCRM can be integrated with different third-party systems. See a short demo on how to setup an integration between a Magento and your Oro application, or keep reading the guidance below. The integration is made possible with the OroCRM Bridge Magento Extension. The OroCRM Bridge can be installed through MagentoConnect. The integration can also be created without installation of the OroCRM Bridge Magento Extension, however the synchronization will then take longer, and some options, such as two-way synchronization, and synchronization of the custom records data will not be available. Define the Role Name that corresponds to your eCommerce store. Click Save Role. The role will be saved and you will get to the page of the role. Click the Role Resources on the left. In the Roles Resources section, set the Resource Access field value to All and save the role. You will get to the Users page. Click Add New User. User Name The name used for login into the account. First Name The first part of the name displayed in the system to refer to the user. Last Name The last part of the name displayed in the system to refer to the user. API Key Define a password for the account. The key shall be at least 6 symbols long. API Key Confirmation Confirm the password. The account is Set the value to Active in order to use the user account created. The user account will be saved and you will get to page of the user. Select the role that you have created for your store. Click Save User on the top right. In order to accelerate the performance of the initial sync, please make sure WSDL cache is enabled in the Magento configuration. Go to the Services section in the tab on the left. Choose Yes in the Enable WSDL Cache field of the General Settings. The CSV support is not supported for the initial import of Magento data to OroCRM, but if you have concerns regarding the impact the import might have on the production environment, you can set up a staging instance with the latest production data, run initial synchronization on the environment and update the integration URL to production once it has been done. 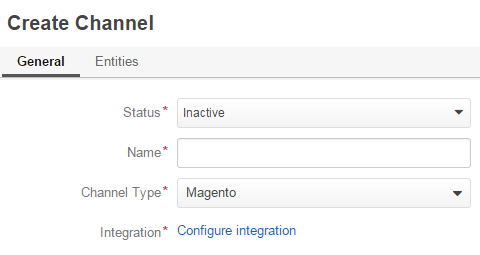 To create integration with Magento, create a channel of Magento type as described in the Channels Management guide. 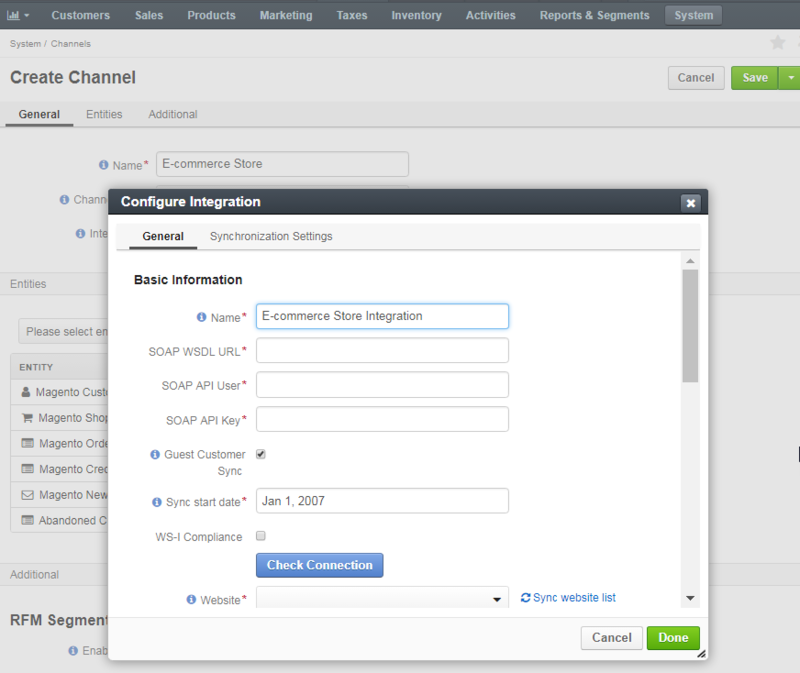 As soon as the channel type is set to Magento, a mandatory Integration field will appear in the General section. Click the Configure integration link. The form will emerge. Name The configuration name used to refer to the configuration within the system. SOAP WSDL URL A URL of the SOAP v.2 WSDL source (this is the URL of your Magento installation plus api/v2_soap/?wsdl=1). For example, if your installation were available at http://example.com/magento/index.php, the SOAP WSDL URL would be http://example.com/magento/index.php/api/v2_soap/?wsdl=1. SOAP API Key The API Key defined for the Magento user above. 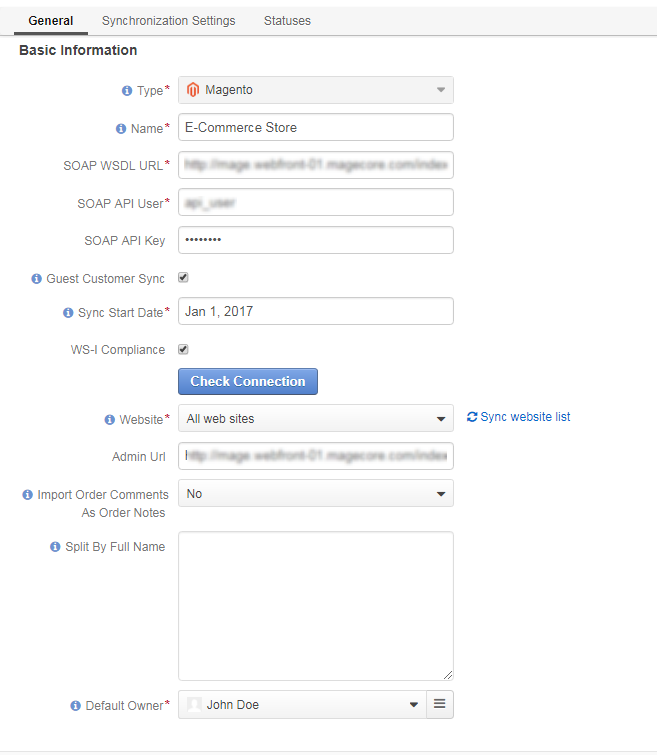 SOAP API User The username defined for the Magento user above. WS-I Compliance Defines whether WS-I compliance mode is enabled for the Magento store. Guest Customer Sync Checking this option will cause guest orders to be combined under a single customer based on email. If a registered customer exists with this email, all guest orders with this email will be attributed to that account. Sync start date Data will be synchronized as of the date defined. At this point, click Check Connection, to see if the settings defined above are correct. Once the connection details have been verified, the following fields will be filled with default settings. The list of all the Websites available for the shop. All Websites option is chosen by default. You can edit the field value and choose one of the Websites available. Only entries of the selected Website are synchronized. Click Sync website list if the list of Websites is outdated. Admin URL Optional field. A URL to the administrator panel of the specified Magento store. Import Order Comments as Order Notes When the option is disabled, order notes are displayed on the Magento Order page only. 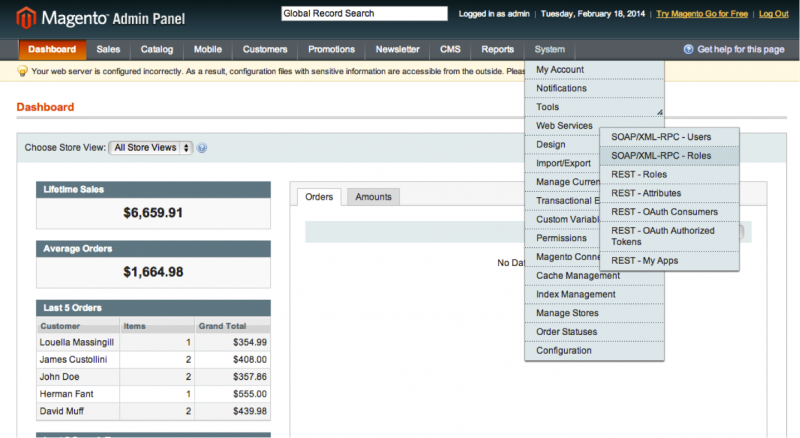 When the option is enabled, order notes are also displayed on the Magento Customer and Account pages. The option is set to Yes by default. Split by Full Name Separate customer accounts are created for Magento customers with the specified email(s) during import. To enter multiple emails, use semicolons or commas. Default owner Specifies what users can manage the configuration, subject to the access and permission settings. By default is filled with the user creating the integration. Be aware that comments added to an order on the Magento side are synced only when OroBridge extension v. 1.2.19 is installed on the Magento side. Otherwise, the Import Order Comments as Order Notes field is disabled in Oro, and no comments are imported. Check the Enable Two Way Sync box, if you want to download data both from Magento to OroCRM and back. If the box is unchecked, data from Magento will be loaded to OroCRM, but changes performed in OroCRM will not be loaded to Magento. Remote wins: Magento data will be applied to the both Magento and OroCRM. Local wins: OroCRM data will be applied to the both Magento and OroCRM. Go to the Edit form of the channel and click Edit link by the integration name. The integration form will appear. Priory defined settings will be shown in the form. Once synchronization has been performed, it is impossible to change the Sync start date. Go to System > Integrations > Manage Integrations. Click the required integration on the list of integrations to open its page. A sync job has been added to the queue. Check progress. This indicates data is being synchronized. You can click Check progress link to see the synchronization status. After successful synchronization, details of the Magento entity records defined for the channel will be loaded to OroCRM and can be processed therein, for example cart can be converted, customer details can be edited and new customers can be added to the system. When you create a channel of Magento type, perform initial sync of the created Magento integration and later delete the channel, Magento Сustomers will be deleted but Accounts and Contacts will remain in the system. If you re-create the channel of Magento type, perform initial sync of the created Magento integration once more, Accounts and Contacts will be populated into the system again, doubling their quantity by duplicates. Please, be aware that this behavior is standard.